Where to buy inexpensive high quality yellow bridesmaid dresses, custom made to order online from under $100. Yellow and lemon are fantastic colors to choose for a spring wedding but you have to be careful on the shade you choose as not all complexions suit bold and bright yellow. Paler shades of lemon may be more suitable for fair skins while bold bright yellows will look stunning on darker skins. But where do you get hold of yellow dresses unless the color happens to be in fashion for that particular year? Our high quality wholesale wedding dress supplier. has a huge selection of yellow bridesmaid dresses to choose from, the ones shown on this page and also on all the other dress color pages, as every dress can be ordered in the color of your choice, whether it be yellow, red, blue or orange! So take a look at the inexpensive bridesmaid or wedding party styles in yellow/lemon I've found for you, all available to buy online direct from my trusted wholesale wedding dress supplier. 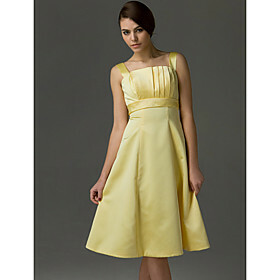 If you are worried about ordering cheap yellow bridesmaid dresses like these online, just read the customer reviews and/or click on the "More info/Buy buttons" for extra information including close-up images of the beautiful styling detail, for example of the bodice or simply to get a better idea of the fabric. You can also start a live chat for online support plus you can order fabric swatches to make sure that your chosen color will match the rest of your wedding theme. To order a swatch, just click on one of the "More info/Buy buttons" below. I love this pretty knee-length dress with gorgeous flower embellishment at the waist. Made from soft satin, the high square neck is really elegant and I think it's perfect for a spring wedding. Another sqaure neck shape, this satin dress has a lovely side-pleated bodice and A-line skirt - read the many customer reviews via the link below. This one-shoulder knee-length dress with criss-cross pleating and ruching could be the perfect beach bridesmaid dress, especially as the chiffon fabric is cool and light. See detailed images via the link below. Tiered satin strapless dress with pretty bow and sash detail. Shown in daffodil yellow, it's also available in 27 other colors. Tip: Remember that if you want to order a fabric swatch, just click on one of the More Info/Buy buttons above to contact the customer services department of our wedding supplier. Or place an order for yourself to check the fabric and make quality and speed of delivery if you have a large number of bridesmaids.